Russian neurosurgeons alongside anthropologists and archaeologists have carried out pioneering tests to better understand how incredible operations on skulls were conducted more than 2,000 years ago. Experts at the Institute of Archaeology and Ethnography united with prominent Russian neurosurgeons for a series of tests that revealed the exceptional skillfulness of ancient doctors, equipped only with primitive tools, The Siberian Times reported on Thursday. The research followed last year’s discovery in the Altai Mountains of three ancient sets of remains, which are about 2,300 to 2,500 years old and are believed to belong to members of the Pazyryk nomadic tribe. The skulls of two men and a woman had holes in them, so scientists suggested that they were examples of trepanation, the oldest form of neurosurgery. “Honestly, I am amazed. We suspect now that in the time of Hippocrates, Altai people could do a very fine diagnosis and carry out skillful trepanations and fantastic brain surgery,” Aleksey Krivoshapkin, neurosurgeon, who participated in the research, told the newspaper. To explore the way ancient surgeons operated, the skulls were first analyzed under a microscope. The precision and accuracy of the doctors was proved by the facts that no traces were found of the method how the skin was removed, and the skull surface remained well-preserved. The scientists revealed that the operations were conducted in two stages. 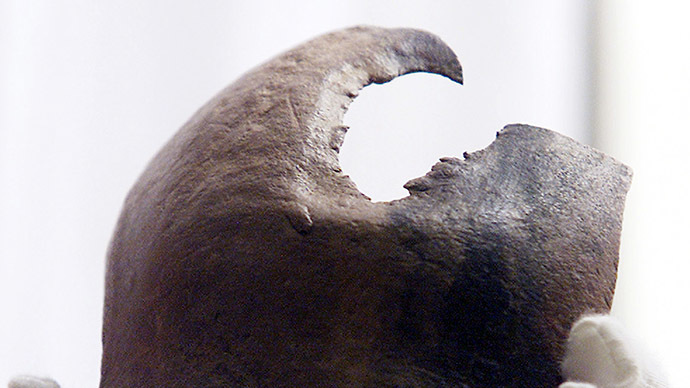 First, without perforating the skull, a sharp cutting tool removed the surface layer of the bone, and only then a hole was cut – with short and frequent movements. At the final stage of the research, scientists recreated the procedure on a modern skull with a replica of a knife likely used. It took them only 28 minutes, but “required considerable effort,” according to Krivoshapkin, who performed the operation. However, it is still unclear whether early nomads used any anaesthetic or painkiller.